Soft play areas are fantastic fun for under 3's and are designed to offer the ideal environment for your child to practice and improve their learning and development skills, play and interact with other children in a safe environment and have fun. We aim to provide a selection of soft play including ball pools and more traditional ride on toys to ensure your child has plenty of opportunity to stretch their legs (and lungs) in the warm and dry. No booking required, simply come along and have some fun. We look forward to seeing you. All children must be supervised by aresponsible adult at all times. We want your child to have lots of fun but would ask that you do not allow your child to act in a way that may harm other children in the group. Prices are £5.00 (for an hour long session), increasing to £7.00 if you wish to stay for the whole morning or afternoon session. Reductions for siblings will be available. Please ensure that you pay for your child as soon as you arrive at the group and that you keep an eye on your child at all times. If you decide you would like to stay for longer than an hour it is fine to just pay an additional £2 and stay for the whole session. Please see our terms and conditions below, along with our gallery of photographs. 1. A responsible adult must supervise all children at all times. 2. Please remember the no food, drinks or shoes are allowed at any time on any of our equipment. Please remove any spectacles. 3. A lot of equipment may have age limits. Please familiarise yourself with this information and ensure that age restrictions are respected for the safety of the children and maintenance of equipment. 4. Always ensure that the equipment is not over crowded, and limit numbers according to the age and size of the children playing. 5. Ensure that children do not push, collide, fight or behave in a manner likely to injure or cause distress to others. 6. No pets or sharp instruments are to be allowed on or near our equipment. 7. Rockers should be supervised closely (especially for little fingers and toes in the way! ), as well as tipping over backwards or sideways. 8. Standing on the walls/sides of the ball ponds should not be allowed. 9. Play equipment must not be thrown. 10. Adults who enter the soft play set up or walk over the soft play mats whilst supervising must remove their shoes. Adults must wear socks whilst using the soft play equipment. 11. Please note that shoes must be worn on all of our ride on items. 12. Ball pools should never be overcrowded. It is the responsibility of the supervising adults to reduce the number of occupants accordingly in particular when young children are in the pools with older/bigger children. 13. Although our equipment and balls from the ball pools are cleaned frequently, it is recommended that supervising adults discourage children from placing balls in their mouths for hygiene purposes. 14. Diving/ Jumping into or Standing on the side of our ball pools must not be allowed. 15. The equipment must not be moved from where it is set up. 16. Please clean up after your child if they are sick or dribble on the equipment. 17. Please use the changing facilities set aside in each venue for nappy changing. 1. By paying to attend the session the supervising adult agrees to adhere to the T&C's and Play Safe Guidelines. 2. A responsible adult must supervise all children & children must be kept at arms length for the duration of the session. 6. N1 Inflatable Fun has Public Liability Insurance. 7. The venue is hired and is covered by their own liability Insurance. 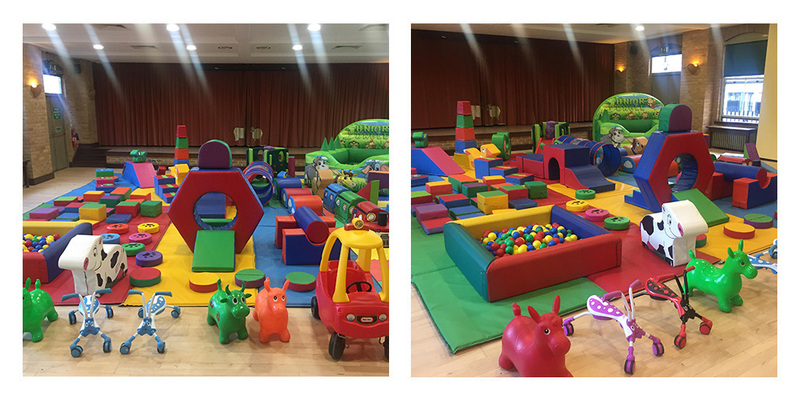 The equipment provided for our Friday Soft Play Group is owned by us 'N1 Inflatable' and we have full public liability insurance. 8. N1 Inflatable Fun will not accept any responsibility for any accidents or injury that occur when using our play equipment.